The Labour Court has adjourned a hearing on the nurses and midwives dispute over pay and staff shortages until next Monday to allow the parties to consider correspondence from the management side which was only received earlier today. The adjournment was sought by the Irish Nurses and Midwives Organisation, which said it needed to examine the content of the management letter dealing with the terms of reference for an Expert Group, and funding for the proposed Framwork on Nurse Staffing. INMO General Secretary Phil Ní Sheaghdha said the union would continue to conduct their business with the employer side tomorrow and the next day to make sure they have the full proposal as set out in the original Labour Court recommendation to put before their 40,000 members when they ballot them. She said that obviously the contract element would have to be dealt with by the Labour Court next Monday, and the union would then be in a position to put a full proposal to their members. Asked whether there had been any discussion of the controversial contract issues such as variable shift patterns and redeployment, Ms Ní Sheaghdha said the Labour Court had not heard that case. 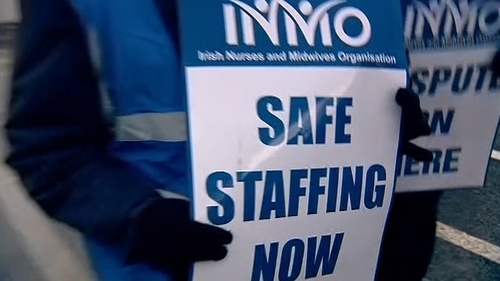 Earlier, the INMO warned that its dispute is not over, adding that the campaign of strike action has only been suspended - not called off. Thousands of patients were disrupted by a series of 24-hour strikes last month. The nurses' dispute: Why isn't it over? SIPTU accused the Government of a "smash and grab" approach in its negotiations on the new contract. Arriving for the Labour Court hearing, SIPTU Health Division Organiser Paul Bell said he did not believe the current proposals would ever be accepted in a ballot of SIPTU's 4,000 nursing members. Mr Bell said his union wanted to see some kind of realistic proposals to advance the negotiations and working within the terms of the Public Service Stability Agreement, which SIPTU always had done during the process.